Our 2019 Chevrolet Silverado 1500 LT Double Cab 4X2 really projects strength and capability in Silver Ice Metallic! Powered by a dedicated 5.3 Liter V8 that offers 355hp while paired with a 6 Speed Automatic transmission with tow/haul mode. This Rear Wheel Drive combination works well together to offer you nearly 23mpg on the highway and all the muscle you need to haul your heaviest loads. Our Silverado 1500 LD W/T works as hard as you do and looks sharp with its bold grille, bedliner, trailer hitch receiver, rear cornerstep bumper, and prominent wheels. 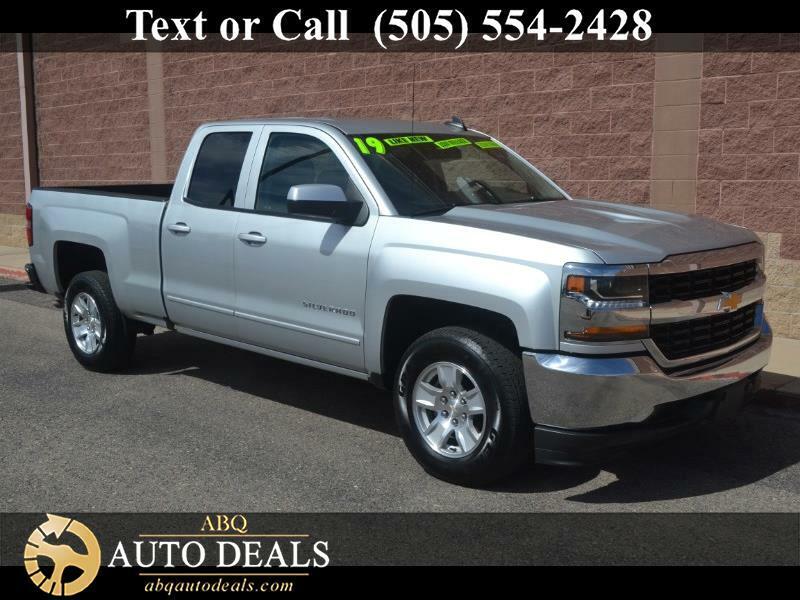 Inside this dedicated Silverado 1500 LT, you'll appreciate the comfortable, quiet ride with easy-to-clean floors and interior that let you focus on the task at hand. Convenience features include power locks, power windows, a driver information center, a leather-wrapped steering wheel with mounted controls, and the Chevrolet Infotainment System that features an impressive sound system with a color display, available navigation, USB ports, and auxiliary jack. With excellent safety scores, our Chevrolet also offers priceless peace of mind and security with a rear view camera, StabiliTrak, 4-wheel ABS, daytime running lamps, and plenty of airbags. Whether conquering your work day or playing on the weekend, our Silverado is up for the task. Print this page and call us Now... We Know You Will Enjoy Your Test Drive Towards Ownership! Your buying experience with ABQ Auto Deals is our number one priority.